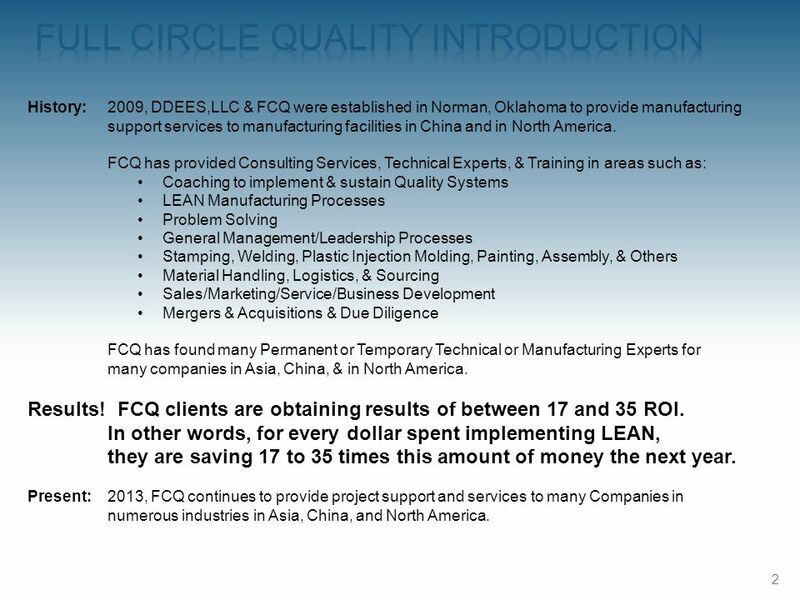 History:	2009, DDEES,LLC & FCQ were established in Norman, Oklahoma to provide manufacturing support services to manufacturing facilities in China and in North America. 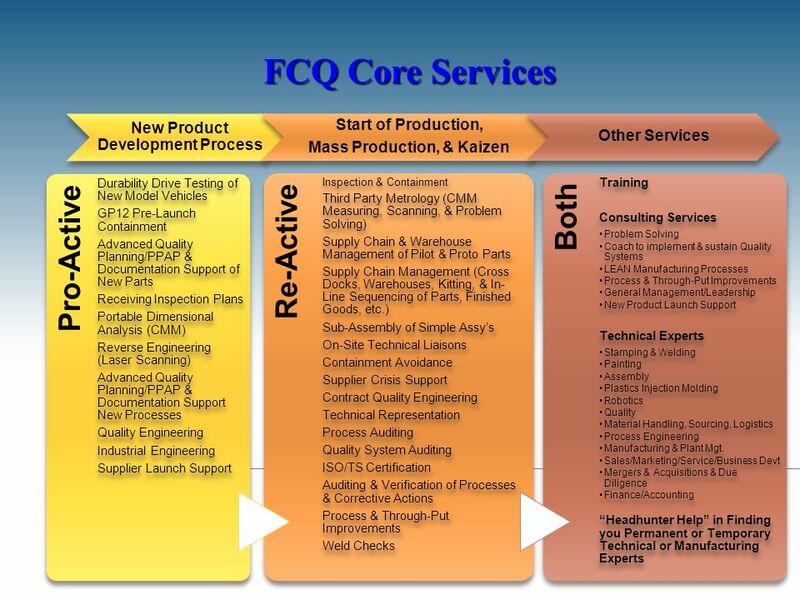 FCQ has provided Consulting Services, Technical Experts, & Training in areas such as: Coaching to implement & sustain Quality Systems LEAN Manufacturing Processes Problem Solving General Management/Leadership Processes Stamping, Welding, Plastic Injection Molding, Painting, Assembly, & Others Material Handling, Logistics, & Sourcing Sales/Marketing/Service/Business Development Mergers & Acquisitions & Due Diligence FCQ has found many Permanent or Temporary Technical or Manufacturing Experts for many companies in Asia, China, & in North America. Results! FCQ clients are obtaining results of between 17 and 35 ROI. In other words, for every dollar spent implementing LEAN, they are saving 17 to 35 times this amount of money the next year. 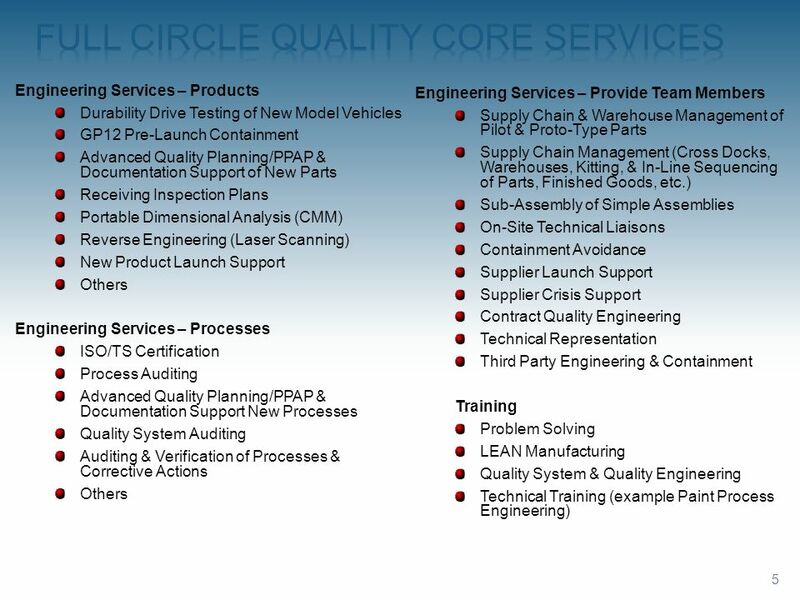 Present:	2013, FCQ continues to provide project support and services to many Companies in numerous industries in Asia, China, and North America. 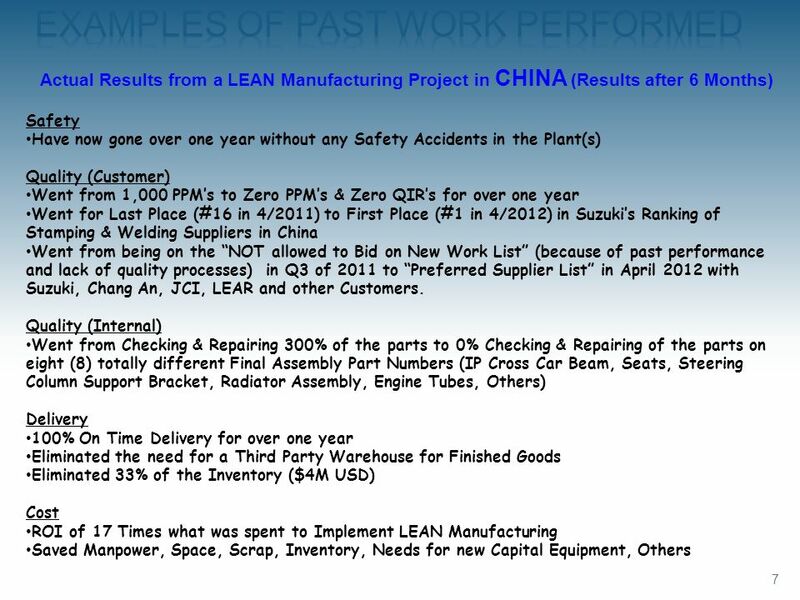 Actual Results from a LEAN Manufacturing Project in USA (Results after 6 Months) Successfully introduced and implemented comprehensive LEAN Manufacturing Processes across 3 Portfolio Companies (at the same time) specializing in stamping and complex welding with annual revenue of $400m. 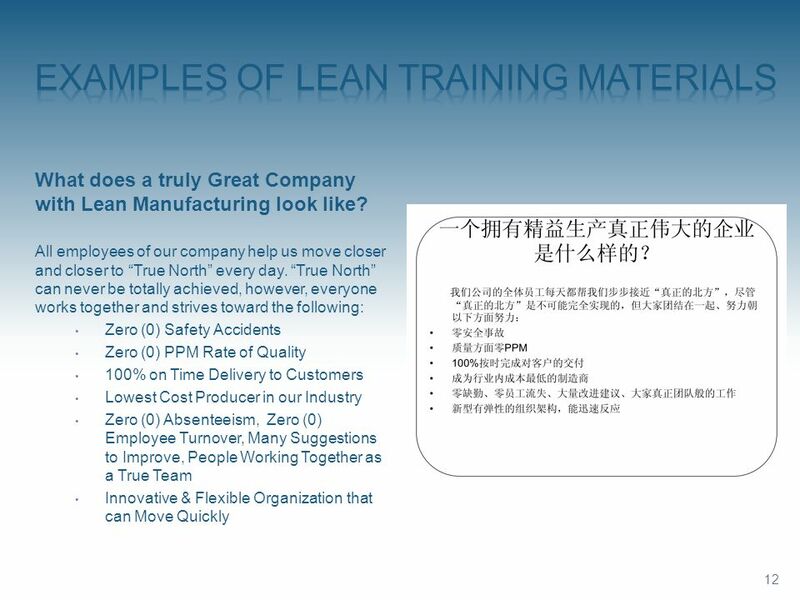 These LEAN Processes included; Toyota Production System, Standardized Operations, SQDCMRS (Safety, Quality, Delivery/Productivity, Cost, People, Revenue, and Speed) KPi Performance Metrics, Throughput Management Process, Quality Gate Launch Process for new parts, Detailed Plant Floor Layered Process Audits, Six Sigma Black Belt Process, Stamping and Welding Standards, Daily Financial Total Cost Management Tracking, and Supply Chain Development. In the first six (6) months, the annual ongoing cost savings were over $17M per year and with an additional $20M of cash generated from reducing the inventory levels. Specific Achievements include: Reduced the “Break Even Point” by 33%. Safety - Reduced OSHA Recordables by 150%. 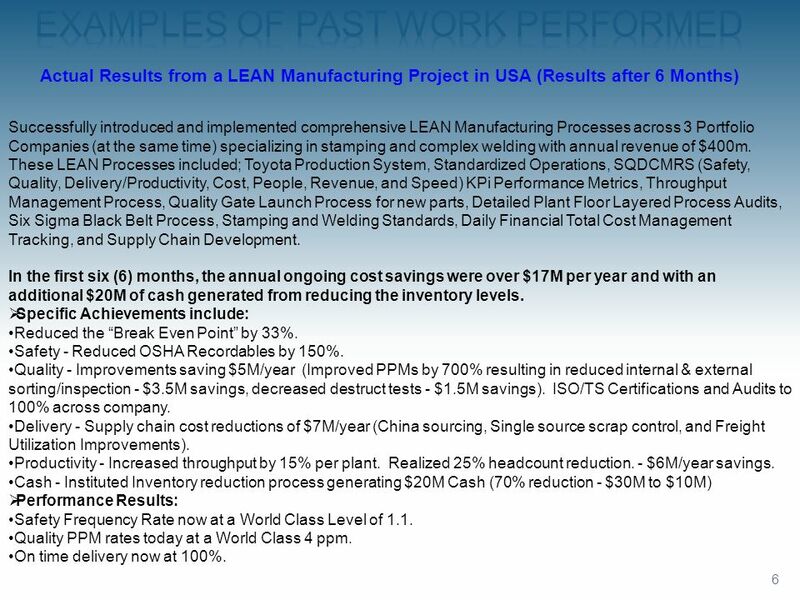 Quality - Improvements saving $5M/year (Improved PPMs by 700% resulting in reduced internal & external sorting/inspection - $3.5M savings, decreased destruct tests - $1.5M savings). 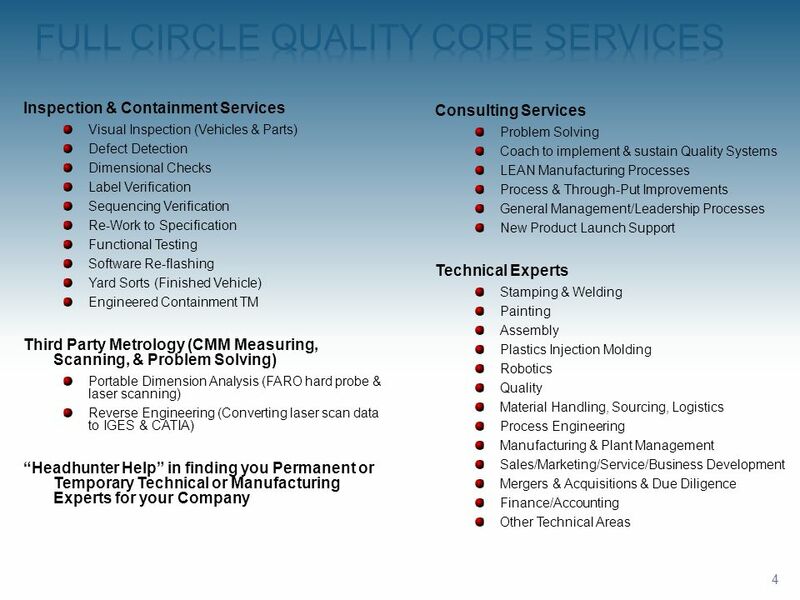 ISO/TS Certifications and Audits to 100% across company. 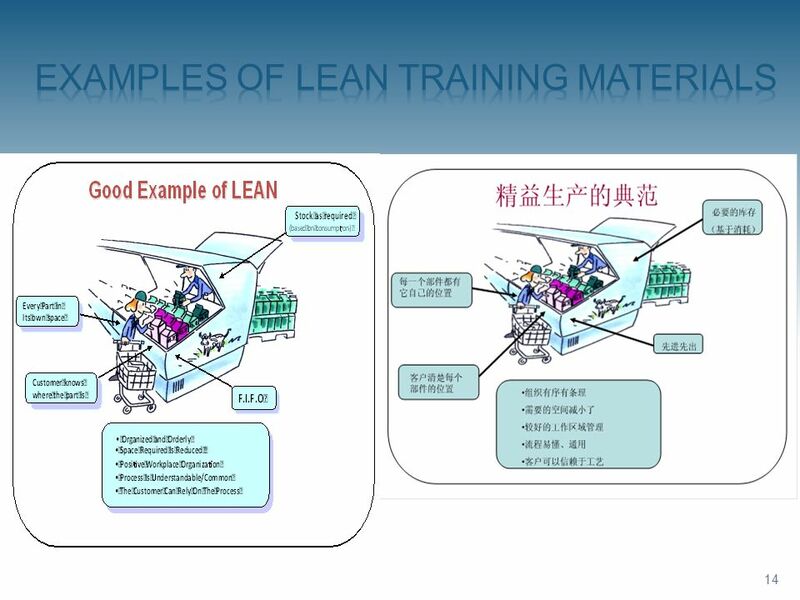 Delivery - Supply chain cost reductions of $7M/year (China sourcing, Single source scrap control, and Freight Utilization Improvements). Productivity - Increased throughput by 15% per plant. Realized 25% headcount reduction. - $6M/year savings. Cash - Instituted Inventory reduction process generating $20M Cash (70% reduction - $30M to $10M) Performance Results: Safety Frequency Rate now at a World Class Level of 1.1. Quality PPM rates today at a World Class 4 ppm. On time delivery now at 100%. 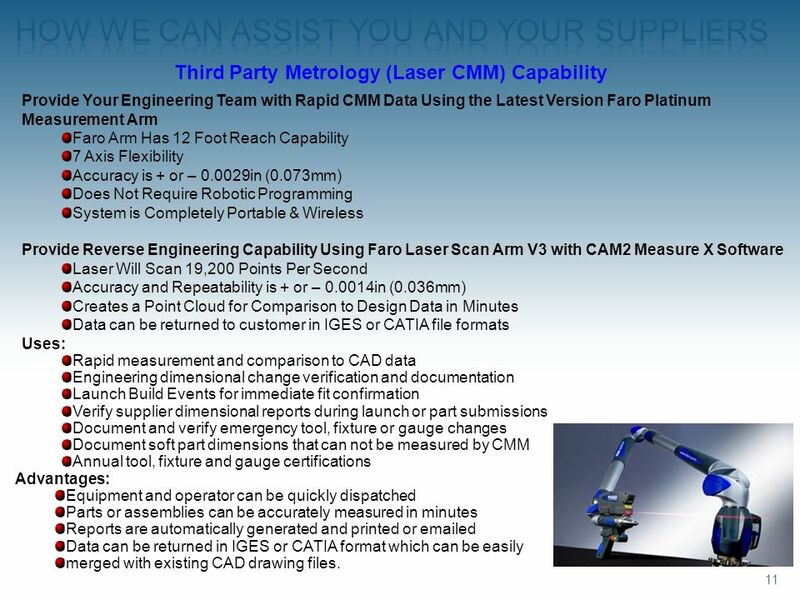 Third Party Metrology (Laser CMM) Capability Provide Your Engineering Team with Rapid CMM Data Using the Latest Version Faro Platinum Measurement Arm Faro Arm Has 12 Foot Reach Capability 7 Axis Flexibility Accuracy is + or – in (0.073mm) Does Not Require Robotic Programming System is Completely Portable & Wireless Provide Reverse Engineering Capability Using Faro Laser Scan Arm V3 with CAM2 Measure X Software Laser Will Scan 19,200 Points Per Second Accuracy and Repeatability is + or – in (0.036mm) Creates a Point Cloud for Comparison to Design Data in Minutes Data can be returned to customer in IGES or CATIA file formats Uses: Rapid measurement and comparison to CAD data Engineering dimensional change verification and documentation Launch Build Events for immediate fit confirmation Verify supplier dimensional reports during launch or part submissions Document and verify emergency tool, fixture or gauge changes Document soft part dimensions that can not be measured by CMM Annual tool, fixture and gauge certifications Advantages: Equipment and operator can be quickly dispatched Parts or assemblies can be accurately measured in minutes Reports are automatically generated and printed or ed Data can be returned in IGES or CATIA format which can be easily merged with existing CAD drawing files. 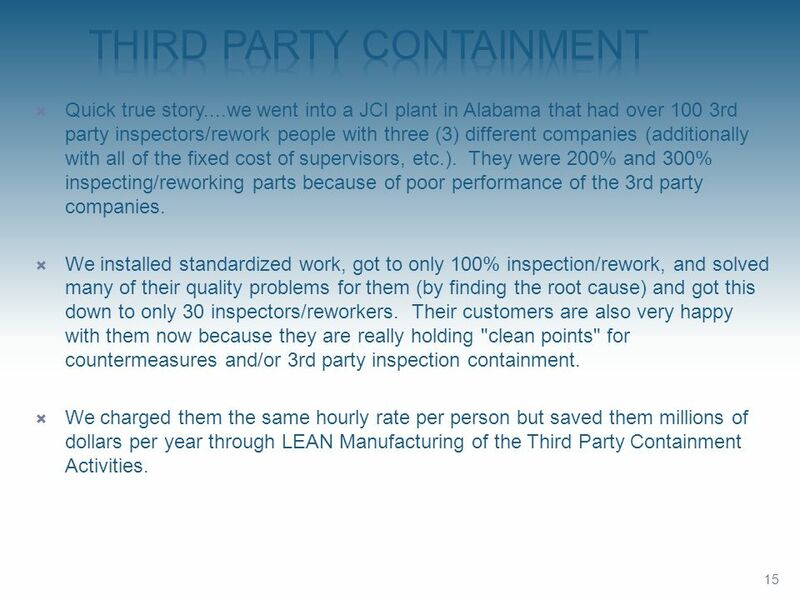 Quick true story....we went into a JCI plant in Alabama that had over 100 3rd party inspectors/rework people with three (3) different companies (additionally with all of the fixed cost of supervisors, etc.). They were 200% and 300% inspecting/reworking parts because of poor performance of the 3rd party companies. 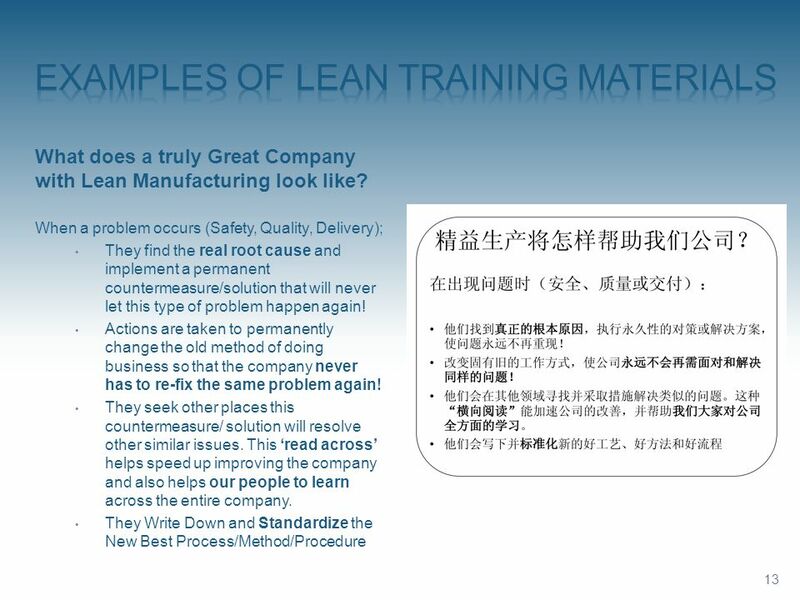 We installed standardized work, got to only 100% inspection/rework, and solved many of their quality problems for them (by finding the root cause) and got this down to only 30 inspectors/reworkers. 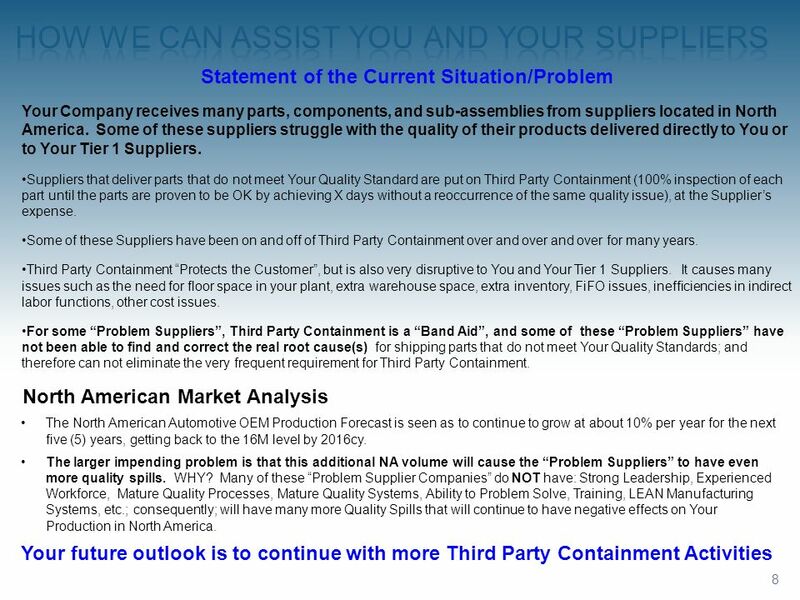 Their customers are also very happy with them now because they are really holding "clean points" for countermeasures and/or 3rd party inspection containment. 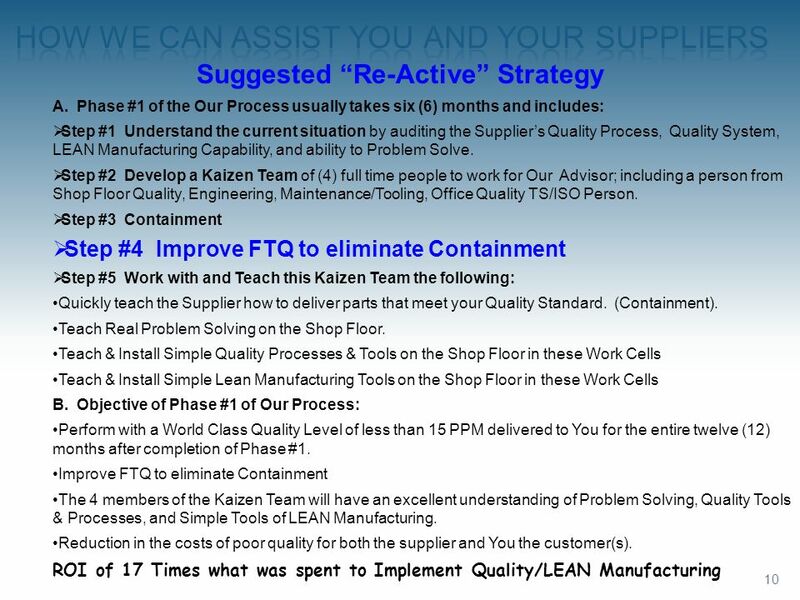 We charged them the same hourly rate per person but saved them millions of dollars per year through LEAN Manufacturing of the Third Party Containment Activities. 16 Why are we unique? When the Quality Engineer is combined with our trained inspectors and our manufacturing quality processes, the results have always been impressive. People are accountable, deadlines are met, data is accurate. 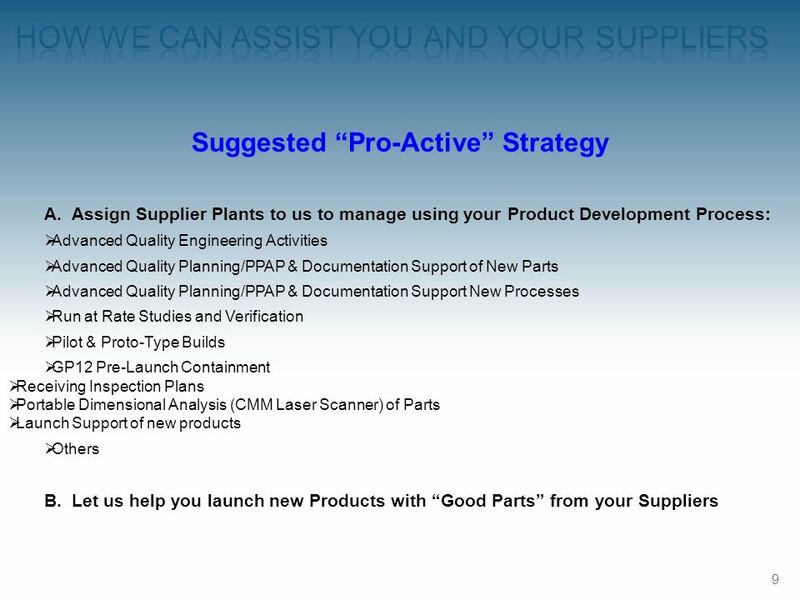 With each project we provide the following… Quality Engineer lead inspection teams Detailed work instruction with customer approval Inspector training and management Production process material flow Non-conforming material control 2nd level engineer audit of all completed totes/racks/parts Daily customer data reporting by shift The bottom line is always cost. The level of service achieved by the addition of our Quality Engineer is typically at no additional cost, however, the value that is provided to this experience is immeasurable! 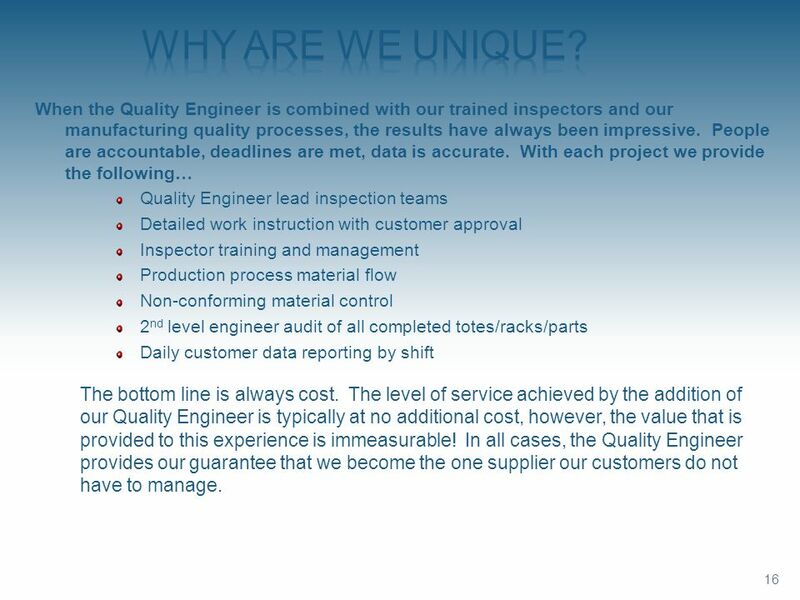 In all cases, the Quality Engineer provides our guarantee that we become the one supplier our customers do not have to manage. 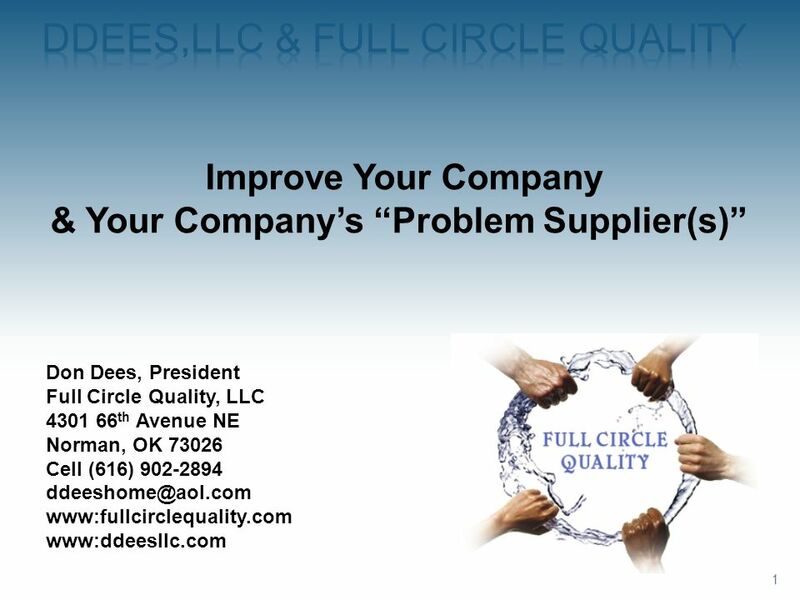 Download ppt "DDEES,LLC & Full circle quality"
Fundamentals of Cost Management Chapter 10 Copyright © 2011 by The McGraw-Hill Companies, Inc. All rights reserved.McGraw-Hill/Irwin. 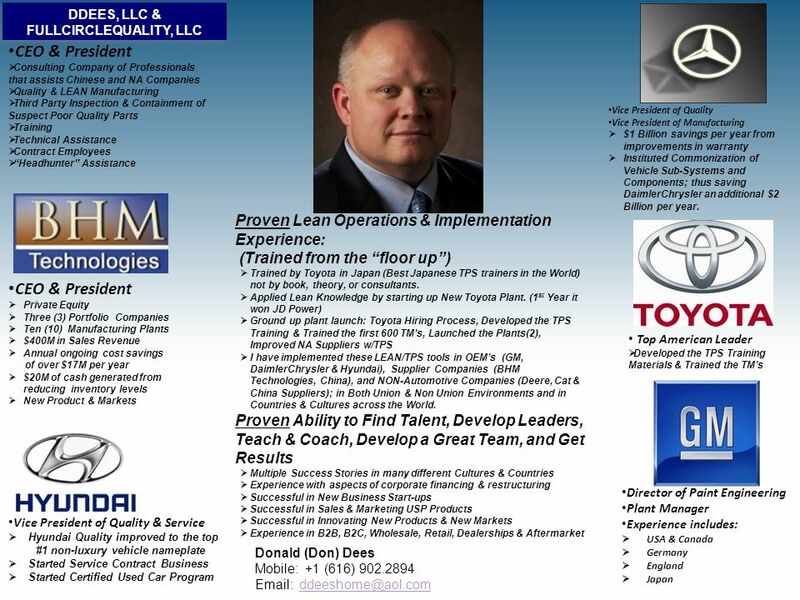 The Toyota Way How They Became #1 Presented by Adrienne Larson. In-house vs. Out-sourced Clinical Engineering David M. Dickey, CHC, CCE Corporate Director, McLaren Health Care Clinical Engineering Services.